Axminster rugs have a rich history and as far back as 1832, American production of Axminsters , at the Lowell Manufacturing Company was very limited - less than 2000 rugs per year. Pictorial rugs were a very popular type of floor covering from about 1895 until the teens. Their wide range of patterns developed from the versatility of Axminster construction. The basic construction was adapted slightly by the Marshall Field & Company, which set up an Axminster mill in North Carolina to manufacture oriental patterned carpets now known as Karastan. These Axminster rugs, with patterns that were recreated from antique orientals, do not have the stiff construction characteristic of Axminsters. Instead, the colors of the surface, not hidden by the weft and stuffers, can be seen on the back, and the rug can be folded in either direction. They are also specially washed and buffed to give an antique sheen - a process not applied to standard Axminsters. The Chenille-Axminster process was developed in Glasgow, Scotland by James Templeton in 1839 at a time when rug manufacturers were continuously seeking new ways to produce rugs and carpets faster and more economically. His method produced rugs which could compete with the wide, seamless, expensive Axminsters. It was a double loom process and any pattern could be produced in any required shape. It only became popular in America after WWI. Axminster rugs are a beautifully patterned wool carpet woven in the most beautiful array of colors. The "Axminster" power look was invented in England in the early 19th century. It was invented to simulate the beauty of hand woven carpet. Axminster rugs are unique due to their intricate designs and European flavor. By 1903 oriental patterns were woven on American Wilton and Axminster machines, produced in an enormous variety of sizes, colors and patterns. 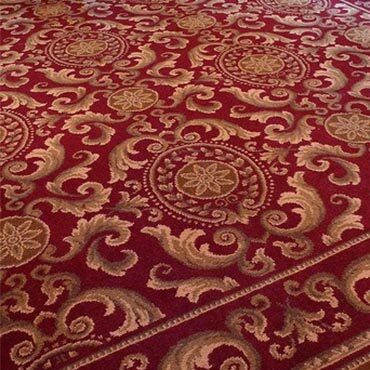 Axminster Rugs are found in fine hotels and beautiful homes throughout the world. Not only are they beautiful, an Axminster rug is constructed to withstand the heaviest of traffic included hotel lobbies, casino's, or perhaps your busy household. If you have a beautiful staircase or a special room to carpet an Axminster rug definitely makes a statement. Axminster Looms - These looms produce Oriental design Rugs. The rugs are constructed through the utilization of three basic yarns: face or pile yarns, warp yarns, and filling or weft yarns. On the Axminster looms the face yarn is introduced to the loom by spools threaded into tube frames. The pattern of the Axminster rug is determined entirely by the sequence of colors on the spool and the sequence of the spools. These spool looms can weave an unlimited number of colors in a rug and some rugs have up to 50 different colors.